Pine Cliffs Resort offers stunning collection of Private Villas for family hire, each with their own private pool and BBQ area. Relax and unwind to your heart’s content, and experience an unrivalled list of memorable activities, ready whenever you are. Located in the heart of the Resort are the stunning Residence Apartments, offering a choice of 1,2 & 3 bedroom apartments on 3 levels : Garden (ground floor), Residence (middle floor), Penthouse (top floor). Surrounded by magnificent pine trees, lies the stunning Pine Cliffs Resort Hotel with it’s magical views of the impressive sandy beach and the blue atlantic ocean beyond. Look out for the fabulous new Premium Deluxe Rooms. If you would like to stay at the Pine Cliffs Resort, the Pine Cliffs Resort Villas or the Townhouses then contact Design Holidays. We can provide an exclusive early booking discount with 15% Early Booking Discount on selected dates at the resort. The Pine Cliffs Resort is widely regarded as one of the leading and award-winning Luxury and Family holiday Resorts in Europe. The Resort is located on it’s own glorious stretch of sandy beach in the heart of the Algarve in Portugal. Experience an all fully integrated luxury family resort, managed by Starwood Hotels through its Luxury Collection brand. Villas with their own private pools. The Resort hosts some of the best luxury apartments to rent in the Algarve. For those luxury family holiday seekers looking for the total privacy of a rental villas or the deluxe service of a five star hotel, then look no further than the Pine Cliffs Resort. Design Holidays offer “Special Offers” for all bookings to the resort. We also offer Early booking discounts on selected dates at the resort. We are a preferred travel partner for the resort and will never be beaten on price when it comes to luxury holidays at the resort, please feel free to put us to the test. Give us a call to find out more about our deals. 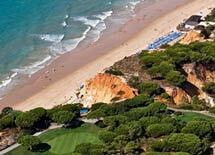 The Algarve resort of Pine Cliffs is situated along a stunning 72 acre stretch of the Atlantic coastline. Unique in its location and outstanding place of natural beauty, the Pine Cliffs complex sits upon the red cliffs of Albufeira, its architecture giving an authentic and all-knowing nod to the area’s deep Moorish and Maritime roots. Mysterious, opulent, Arabic embellishments and ornate gardens are found throughout the luxury resort. The stunning ‘Praia da Falesia’ beach lies 200ft beneath the Pine Cliffs resort. The wide range of accommodation options are influenced by traditionally Portuguese heritage, ranging from golfing suites to rooms with private terraces with airy, Arabic infused interiors and patios, intricately decorated with tiling and colourful murals designed in perfect harmony with the historic atmosphere and stunning Atlantic Ocean. The most glamorous and well known part of continental Portugal, the Algarve positions itself as one of the most popular destinations in Europe. With 10 million visitors per year, the resort of Pine Cliffs manages to provide a beautiful sanctuary for the more discerning lover of the southern Portuguese region. The Algarve region is also famed for it’s wine production, fishing and aquaculture, whilst its warm climate successfully farms fig, almonds, oranges, strawberry trees and cork oak. The Algarve is the most popular tourist destination in Portugal, and one of the most visited in Europe. Its population triples to nearly 1.5 million people in the peak holiday season thanks to seasonal residents, and receives an average of 7 million foreign tourists each year. In total, including national visitors, almost 10 million people visit the Algarve annually. Pine Cliffs resort resides in the province of Albureira. The name is Arabic in origin, showing off the mix of historic influences in the area. “Al-buhera” means ‘Castle of the Sea’, describing its coastal location exotically. Ancient settlements in the area were once occupied by the Romans, with remains of roads, aqueducts and bridges still possible to view. The Algarve in Portugal is famed for its idyllic, heady blend of luxury holidays and thus it is no understatement that Pine Cliffs resort has been awarded as Portugal’s leading resort for four consecutive years and Best Golf Hotel in 2015, whilst the 7000 metres squared of dedicated kid’s clubs and sports academies make the luxury resort a real all rounder, suitable for families and corporate excursions alike. Pine Cliffs resort is less than thirty minutes from Faro – its nearest flight destination – and is less than three hours flying time from British airports. The decadent array of dining and accommodation options make the resort unbeatable in quality and choice. The resort is one of the leading and award-winning Luxury and Family Resorts in Europe located in the Algarve, in Southern Portugal. The resort has been voted Portugal’s leading Family Resort for the last 4 consecutive years. The resort extends across 72 acres of beautiful landscape surrounded by pine trees. The resort is set on the red cliffs of Albufeira enjoying stunning views out to Praia da Falesia beach. The Pine Cliffs Resorts serene moorish architecture and elaborate gardens recall the rich heritage of the land. Portuguese is the national language spoken throughout the Algarve, although most locals will also speak some English. The Euro is the accepted currency and most stores and restaurants at the resort and the surrounding area take all major credit cards and debit cards. The resort is an all integrated resort, managed by Starwood Hotels through its Luxury Collection brand. Guests at the resort enjoy various services provided by the Resort, including the Golf Academy and the new Annabel Croft Tennis Academy, the only one in Portugal and the second in Europe. Appealing to golfers and non-golfers alike, the leisure facilities are extensive including the swimming pools, gardens, the health club or the beauty salon. Pine Cliffs Resort has fabulous leisure facilities for all the family from golf, tennis, swimming pools, spa, kids club, water sports, boutiques and an abundance of stunning restaurants,bars and pool bars – making it the perfect luxury family holiday. 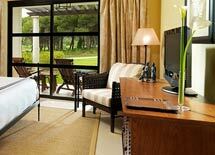 The Pine Cliffs Resort Hotel – A 5 star, recently refurbished luxury hotel in the heart of the Pine Cliffs resort. Spacious, light and airy, rooms are designed to show splashes of proud Moorish heritage whilst keeping modern creature comforts. The Residence Apartments are the most sought after and sublimely located accommodation, with easy access to the golf course and offer a choice of Garden, Middle or Penthouse apartments with a choice of two or three bedrooms. The Pine Cliffs Premier Club Townhouses and Villas are ideal for families and/or larger groups of visitors. The Townhouses and Villas vary in bedroom number but all have full self catering facilities and designated barbecue area for those evenings in. Whilst all guests have access to all the Pine Cliff’s activities, spa, sports and dining options, the Pine Cliffs Villas also have their own private swimming pool, and in the deluxe villa, even their very own jacuzzi. As mentioned below, The 78 Golf Suites are an ideal, functionally designed option for those visiting Pine Cliffs on a predominantly golf – focused holiday. Each suite overlooks the course and all have private balconies or terraces and fully working kitchen. Pine Cliffs Resort provides its guests a simply sublime, dining experience with a selection of restaurants and bars located on site. The opening and closing times are subject to change and may vary from week to week upon availability. For further information, please contact Design Holidays on 01444 87 22 00 for expert information. Located conveniently on the resorts Golf Course’s first Tee – the Clubhouse is the ideal spot for snacks, sandwiches, steaks, and a drink with your fellow golfers. The opening and closing times are subject to change and may vary from week to week upon availability. Discover the Tapas Club Bar – Wine & Tapas and end your day with a perfect culinary combination. Seeing is believing when arriving at Pine Cliffs resort. The coastline and Atlantic ocean waves are a stunning sight to behold. The stunning ‘Praia da Falesia’ beach lies 200ft beneath the Pine Cliffs resort. The Beach Club is beach side restaurant with fresh fish, seafood and salads, with super refreshing drinks, ice creams and snacks. Parasols, sun loungers and towels are ready and waiting for Pine Cliffs’ guests to take up their place in perfect harmony, enticing the sun worshippers and water-loving guests to a utopian paradise on Earth. For our more restless, water-loving, adrenaline-loving guests, water-sports are available ranging from jetski-ing to kayaking. 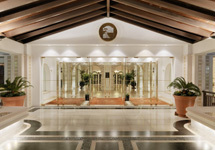 Winning the Best Golfing Hotel in Portugal in 2015, the golfing facilities at Pine Cliffs, for many guests, is the prime reason for choosing the resort. The golf course itself is atop of the cliff, and this vivid, lush green carpet is one the Algarve’s most stunning, exclusive courses. The astonishing Atlantic Ocean in full view, the fairways run in parallel and are lined with pine trees. The “Devil’s Parlour” is the most famous part of the Pine Cliffs golf course. The mischievous sixth hole carries a par of three and needs a 198m shot over the cliffs to reach the green, a memorable swing in any outcome! As the Algarve’s leading resort, Pine Cliffs would not be complete without a sumptuous spa for discerning guest in need of complete, total relaxation. Our specialist massage therapists are trained in a wide range of techniques and traditional massages. Emphasis on problem areas such as back tension, leg muscles along with deep lymphatic drainage is encouraged after any sporting activities and aim to eliminate any aches and pains, whilst wellness and general rejuvenating treatments and specialities are also available. Deep tissue, Lomi-Lomi, Shiatsu, Ayurveda and aromatic candle massages amongst many other treatment possibilities make the Pine Cliffs Spa a sublime utopian haven. our new, exclusive Annabel Croft Tennis Academy! Annabel Croft Academy The Annabel Croft Tennis Academy is a new academy at Pine Cliffs, the only one of its kind in Portugal and the second in Europe. The five, flood-lit tennis courts are put to best use with daily lessons according to age, experience and ability, with the world famous Annabel Croft, a former British Number 1 of Women’s Tennis having developed a specialist training programme for those who wish to perfect their tennis skills whilst enjoying a great vacation. The Pine Cliffs resort is not only suitable for corporate hire, events, golfing excursions, spa packages or sporting holidays, but often provides a stunningly lavish venue for an unforgettably romantic wedding. With all of our restaurants and meeting rooms available for hire, please get in touch with our wedding planning experts at Design Holidays. With golf, tennis, and spa facilities all offered at an award winning levels, the Pine Cliffs resort dares to offer the perfect holiday to all its guests, whether young or mature. It is essential our experts and partners, Design Holidays, go through your requirements and preferences to make your holiday with Pine Cliffs the best it can be. The finer things in life are in abundance here, a glittering example of how Holidays should be, and to book your Pine Cliffs resort holiday, call us on 01444 87 22 00, today. Design Holidays will always reply within 24hrs to your request. Rates for each Hotel option are listed separately, depending on room option, whereto choosing to stay in our Hotel rooms, Townhouses, Villas with private pools or indeed our range of Golf Suites. Tennis/Golf Academies, Spa Programmes and Details on Bookable Excursions and/or local Car Hire. With such a wide range of accommodation options, Pine Cliffs have many great offers to suit our distinguished, sunshine-seeking clientele. For more details and to request a quote call our Design Holiday Partners who promise to match any price found elsewhere. Telephone our expertly trained booking team on 01444 87 22 00. The nearest Airport with international links is FARO. A gateway to the Algarve, the distance from Faro Airport to the Pine Cliffs Resort is approximately 35km, taking around 30 minutes by hire car or taxi. Cost around 50€ and are available through our team. Ask our experts at Design Holidays to arrange a hire car if required, fuel costs sit between 6-9€ from Faro Airport to Pine Cliffs resort, and prices vary depending on length of hire and type of vehicle. For help and advice please telephone our expertly trained booking team on 01444 87 22 00. Check out is usually at 11am however we can work around your flights – just let us know your requirements in regards to leaving the Pine Cliffs resort in Albufeira and we’ll work around you. The staff at this resort have been amazing, so helpful with all of our requests. The villa itself is stunning, housekeeping do a great job at keeping it clean. Special thanks to the reception team, concierge and also the maintenance / grounds team who were always helpful and hard working. The beds are very comfortable - one thing I would mention is that the rooms were a little cold on some of the nights however the team were brilliant in that they came and lit a fire for us in the living room which was lovely. We will definitely be back! Absolutely beautiful, comfortable and well-equipped apartment, maintained to very high standard. The grounds were lovely, and service is generally excellent. It's a very large resort though, and I'd be less keen on the environment if all accommodation was fully occupied. The Pine Cliffs resort has partnered with Design Holidays to tailor your trip away – they aim to make your stay the most memorable and individually perfect it could possibly be. Quite simply, the Pine Cliffs resort in the famous Southern Portuguese Algarve aims to provide the facilities to enable the trip of a lifetime. 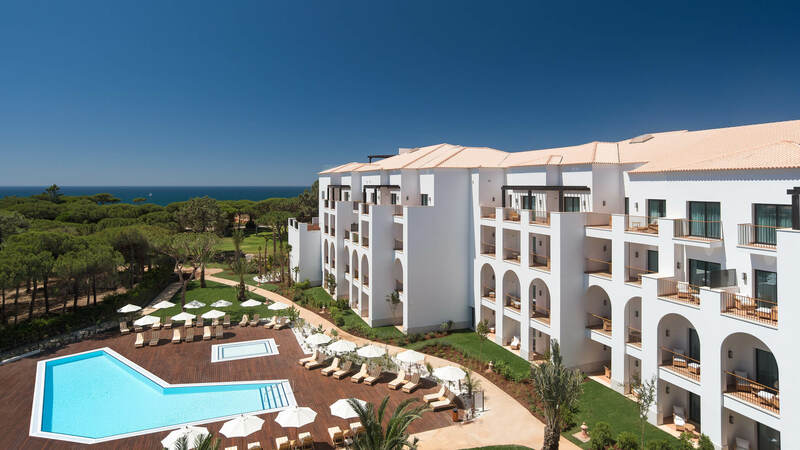 Whether an action-packed, idyllic family holiday or an uninterrupted, romantic honeymoon in the the Albufeira region, Pine Cliffs offers some of the best resort facilities in the world. Dramatic, red-tinged cliffs relaxing provide the perfect scenic backdrop to the stunning “Praia da Falesia” beach within a short-haul flight distance from the UK. To book your holiday at Pine Cliffs resorts, or to find out more about our packages – including any of our spa or golfing offers – or, for booking places on our golf and spa packages – please telephone our expertly trained booking team on 01444 87 22 00. The Pine Cliffs resort looks forward to you joining them.